A perfect trimmer for your beard, the ergonomic Philips QT4000 comes with skin friendly stainless steel blades and gives a precise trim always. 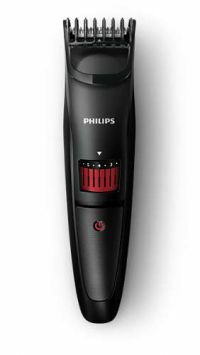 Philips QT4000/15 Trimmer A perfect trimmer for your beard, the ergonomic Philips QT4000 comes with skin friendly stainless steel blades and gives a precise trim always. Style your beard the way you want with this beard trimmer. Precision from as short as 1 mm up to 10 mm. Set the trimmer at the lowest position for a perfect 3-day beard, just 1 mm long. Turn the wheel to simply select and lock-in the length settings you want: from a short beard of 1 mm up to a full beard of 10 mm, in precise 1 mm steps. To Recieve updates and possible rewards for Philips QT4000/15 please sign in. To Recieve updates and possible rewards for Trimmer, Clipper & Shaver please sign in.